National Ski Patrol honors excellence in a multitude of disciplines. We proudly acknowledge our regional patrollers that have been recognized at Division and National level as the best-of-the-best. David Nelson has been a patroller for 15 years. He is an OEC instructor, OET instructor, and has also been the instructor of record for numerous Introduction to Ski Patrolling classes. He has planned, organized, and instructed the candidate patroller program, which involves a mammoth effort of coordinating over 15 instructors for OEC, OET, lift evacuation, and mentoring, and trains 15-20 candidates each year. Joshua Endsley oversees the patrols for two separate mountains, a combined 250 patrollers, both professional and volunteer, that operate in both winter and summer. Endsley instructs lift evacuation, OET, risk management, avalanche rescue, and CPR/AED recertifications for his patrol. He supports the Certified Program by teaching three different modules and encouraging patrollers to pursue the Certified Program. Mt. Baldy Ski Patrol has participated in 13 Avalanche Awareness seminars with Adventure 16, Local Ski Clubs, and Ski Dazzle over the last 3 years. In addition, this mountain has participated in two fundraisers for the Southern CA Snow and Avalanche Center over the last 3 years to raise money for our local Avalanche Forecast Center. This patrol has several patrollers who volunteer at Ski Dazzle to help promote and recruit for the National Ski Patrol. Mt. Pinos Ski Patrol is trained in a variety of mountain skills such as Mountain Travel and Rescue, and avalanche avoidance and rescue. In addition, some members of our patrol are registered with the California Emergency Management Agency (CalEMA) and participate in statewide search and rescue efforts. Barbara Razo is a patrol room lead at her hill, a task she was given after just a few years of patrol experience, where she guides and coordinates the care of injured and ill guests. 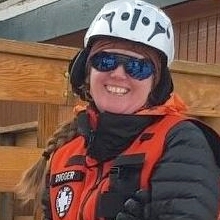 She also mentors new patrollers and new leads in the aid room, teaching them skills for report writing, room procedures, ambulance protocols, guest relations, and the interface with the paid staff. She has previously been named Southern California Region Outstanding Patroller and Far West Division Outstanding Patroller, and was runner-up for NSP National Outstanding Patroller in 2008. Tina Choi-Nelson In three short years this patroller has demonstrated a remarkable ability to embrace and embody the mission of NSP, learn and hone the skills to not only be a great patroller, but an instructor, and has reached beyond the boundaries of the NSP organization in her efforts to engage, enlighten, and collaborate with businesses, government agencies, and educational institutions to advocate on behalf of Ski Patrol; to champion it’s causes and it’s mission to expand the base of support. She truly believes in the importance of NSP and the critical need for advocacy in membership as well as fundraising to continue the legacy of this great organization.